Accessory Genie - Consumer Electronics and Accessories Industry News: A Superhero Clock that makes you breakfast! TGTBT???? A Superhero Clock that makes you breakfast! TGTBT???? You see all these infomercials (and news stories) talking about all these "inventions:"creams that can make your wrinkles go away, powder that can take off any stain, seeing-eye dogs that can drive (seriously, this is really true! Check it out online! ), etc. But have you ever heard of a Superhero Clock that can make you breakfast???? Ok, neither have I, but this clock is (almost) just as cool! Picture this: you are sleeping in your bed and your alarm clock sounds. Then, a call comes in, which you take. Afterwards, you play some music to get you in the mood to get out of bed. Imagine that you did all that with a device that is a wooden-paneled alarm clock that is ALSO a Bluetooth speaker AND it can answer calls! This is no joke; it's the GOgroove BlueSYNC TYM! When I first heard about this, my thought was "whatever. How can a clock do all this?!" Then I was brought up to date with the TYMs (yes, pun intended!) and now I see this is all true! 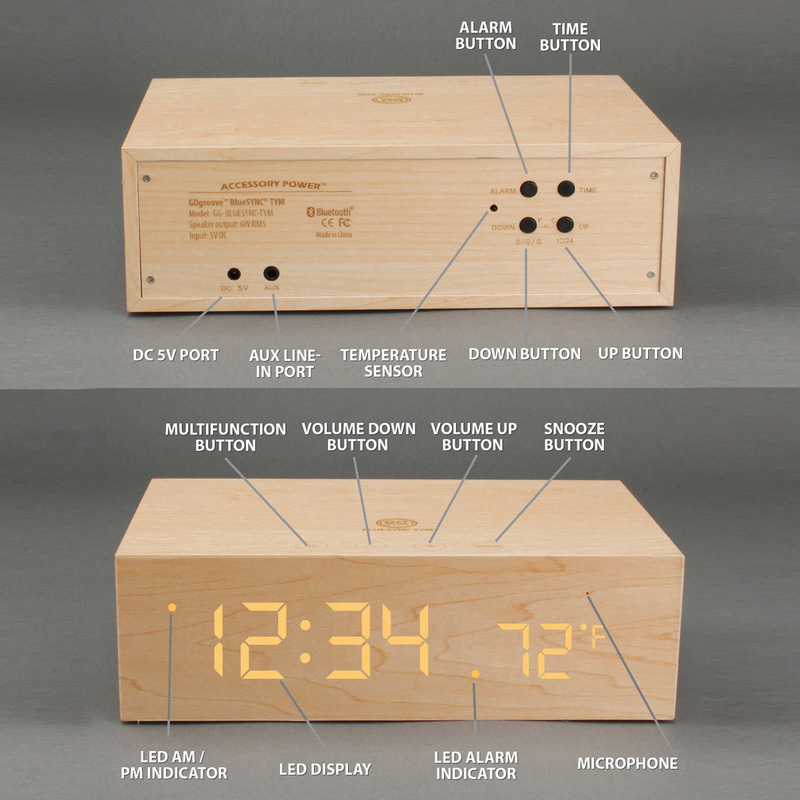 The GOgroove BlueSYNC TYM is a Bluetooth alarm clock enclosed in a wooden casing. You already know it can tell the time and set an alarm, but it also has a weather sensor to display the temperature in Fahrenheit or Celsius. You can stream music wirelessly from your cell phone, MP3 player or tablet and there's also a 3.5mm input to play audio from non-wireless devices (laptop, desktop, CD player....believe it or not, I still have one!). It is powered by an included AC adapter. I know, I know - it still sounds TGTBT, right?! But after you have had the chance to experience the GOgroove BlueSYNC TYM you could not imagine going back to how your life was before! Buy it before it's sold out! Sheesh, now I'm starting to sound like an infomercial! Clip it on and have some fun!